Over the past 2 years I’ve written over 300,000 words about money, spent over 200 hours talking and recording for the podcast, answered over 1,700 reader emails, and done over 200 media interviews all about money. Many people ask me what’s my best piece of advice about money. I usually give some sound byte answer that to the person asking me is just enough for their article or situation, but it’s actually pretty basic. See, when it comes to money, most people are surface level. They do the bare minimum if they do anything at all. They wonder why their life isn’t moving forward when they spend 5 hours a night watching Netflix and scrolling through Instagram. Then it hit me at 6 this morning, as I’m decompressing from putting literally everything I’ve learned about money in my life into one book. As I’m watching the sunrise over the mountains in Sedona. Only you can find your next level, not someone else. Not some blogger’s next level or your friend’s next level or your parent’s next level or the media’s next level. The fundamentals of money and getting rich are easy – make more, save more money, invest, repeat. But how fast you can make it happen is all about finding your next level. And doing it every day. No, not monthly or yearly. Yes, daily. Saving at least $50 a day helped me reach financial independence at least 10 years faster. Money is simply a human invention. We embed it with emotion and meaning and purpose. You can either control it or it’s going to control you. It’s something to be mastered, used, and optimized. Not something to hold you back. If it’s holding you back you need to look at the other areas of your life, it’s not money’s fault. Something’s going on that you need to change. You need to find your next money level. The more you master money, the more control you will have over the other areas of your life. The more options and opportunities you will have. So many of the experts out there will tell you the key to wealth is automation, but automation is not enough. Automation is the status quo. It’s how you get complacent. It’s thinking that saving 5% or 10% of your income is enough. It’s not enough. It’s just the beginning. If you are saving 10%, you need to do everything you can to save 11%. If you want to buy that new car you’ve been dreaming about for years, it’s about saying no and learning that just being able to buy something is enough – you don’t actually have to buy it. It’s about spending those extra few hours on a Saturday morning before everyone else wakes up working on your side hustle. It’s about knowing that you need to leave your job because you’re unhappy and actually going into your boss’s office and doing it. It’s easy to automate, to coast in life. But coasting won’t get you to the next level. Financial independence is not built on complacency. It’s built on pushing your boundaries as often as you can. It’s about being uncomfortable sometimes. It’s about growing and learning and challenging and pushing. And then pushing more. Sure you can sit back and follow the expert’s advice – “keep doing this and you’ll be able to retire in 30 years!”. Are you kidding me? If you settle for a status quo, that’s cool, but settling for the default will impact other areas of your life. I can tell you one thing, it going to be really hard for you to get ahead unless you make sacrifices and keep pushing your boundaries, keep pushing your comfort zone. If you want to be an entrepreneur (are you an entrepreneur?) then stop talking about it, throw away your “hustle harder” t-shirt, and actually get down to work. I’ve had the opportunity to work with many entrepreneurs and the only differences between an entrepreneur and a wantrepreneur are two things – getting started and then keeping at it. If you want to start a blog or start actually making money online, or become a writer, or whatever you want to do. Just start doing it, keep doing it, and never settle. You have to push. You have to want it. It’s easy to sit back and play it safe. It’s wired into our DNA – don’t touch the fire, don’t peek over that cliff. Fear keeps us safe, it keeps us alive. But it also keeps us from truly living, from growing, and from getting ahead. Unfortunately, we live in a fear-driven world. But what’s actually pushed humanity forward is the same force that will push you forward – taking calculated risks. Finding the way around the fire and over the cliff. I can tell you another thing I’ve learned about life and money the past few years – the more calculated risks you take, the happier you will be. Whether it’s asking for raise, investing in the stock market, starting a side hustle, quitting your job, taking a mini-retirement, whatever it is, taking calculated risks is the smartest way to push forward in all areas of your life. Taking calculated risks is a lot different than just being risky. Don’t be dumb. Be strategic. Make a plan, weigh your options, evaluate the implications, evaluate the alternatives. Write down the pros and cons. Do a SWOT (strengths, weaknesses, opportunities, threats) analysis (learn how here). One of the best ways to take calculated risks is to develop a set of principles to help you make decisions. Principles give you a framework for making decisions. If you haven’t read it yet, definitely check out Ray Dalio’s book Principles: Life and Work – it will help you see the world in a new way and help you make better decisions. It’s one of the best books on making decisions I’ve read. We live in a world where people are trying to take both your money and your time. “Can I just have 5 minutes, sir?” “I have a great deal for you.” Meetings, meetings, meeting. Bills, bills, bills. Etc. etc. But if you want to get ahead with money (and other areas of your life), you’ve got to learn to say yes to yourself and no to almost everything else. No one cares about your own time or money as much as you. Give both generously when you want and protect dearly when you don’t. If you just let life happen to you, if you coast, then it’s naturally going to eat up both your money and your time. That’s just the way the world works. If you don’t push against the current, you’re more likely to get carried away. If you want to get to the next level, you’ll need to say yes to things that push you forward and no to almost everything else. Learning to say no was one of the hardest and most important lessons I’ve learned. And I’m still learning how to do it. If you want to make more money look for the next level. If you want to save more money look for the next level. If you want to be an entrepreneur look for the next level. If you want a different life look for the next level. While money won’t solve all your problems, it can definitely buy you more freedom. More opportunities. More time. And remember money is not the goal, time is. While there are many levels of money management and optimization, here are a few next steps you can take today, as in right now, to push to the next level. All of these can help you save and make more money. Start tracking your net-worth for free using Personal Capital. Your net worth is more important than your income and is the most important measure in personal finance. Tracking it regularly will not only motivate you, but it will help you make better decisions. If you have student loans, see if refinancing can save you money (most people are leaving money on the table). Check out some good rates here. Optimize your insurance – most people are paying to much for car insurance. Here’s the cheapest and best car insurance I’ve found here. Start building your case for raise using this strategy. Evaluate whether you should buy instead of rent. Definitely, check out house hacking. BTW – I am opening up one more private coaching spot and I’m looking for the right fit. If you are interested in working with me and you’d like to apply sign up below. Success! Now check your email to confirm your subscription. I will let you know if any spots open up. And that’s the just the beginning. There is always more to learn about saving and making money. There is always the next level. Keep searching for it. Keep pushing. Great article. I’m looking for my next money level right now and could use some insight. I have a niche website that pulls ~$1400-1800 per month via Google AdSense and Amazon affiliate sales. I believe I’ve maxed out it’s ability to scale and I’m contemplating selling it. Flippa estimated it would sell for over $20k. Here’s where I’m stuck. Should i sell to reinvest in another venture or just keep it and pocket the money? Deep thoughts, Grant, and very well written. There’s no template or formula that fits everyone for creating time, freedom, and a fulfilling life. But complacency won’t get you there either. For people who find it difficult saying no I think it’s wise to cultivate a response that bides them time, instead of being on automatic pilot with a yes. Saying, “let me check my calendar” or “I’ll have to get back to you” is much better than saying yes, and then regretting it. So many great nuggets of information packed into one post. It got me motivated and then gave me actions to take! Nice Grant. Discipline, effort, showing up. Those three things applied to what you wrote above will get you there. I think so many people show up, put some effort in, and then when things don’t go right immediately they lose focus. That’s the discipline part. You gotta keep plugging away at it. Yessss. We can always be doing something extra to push ourselves. After all, pushing is what got us to where we are today. You don’t achieve great things in life if you don’t step outside of your comfort zone a bit. Awesome post man. 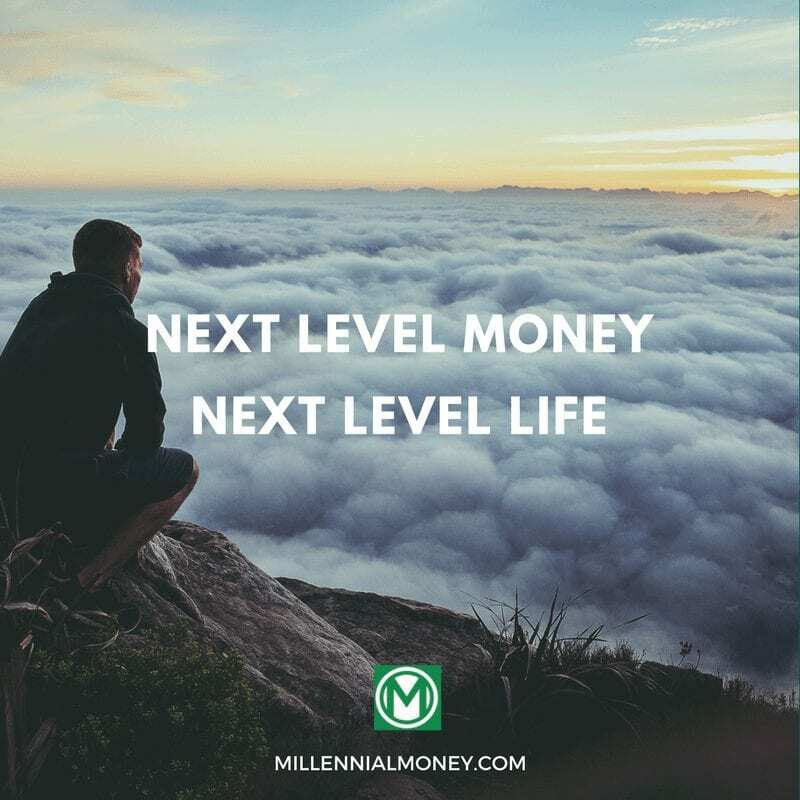 You could read/hear/see all the lessons in the world about personal finance, but unless you find “your next money level”, you will struggle to achieve it. Most people who strive and obtain wealth are doing it for specific reasons. To elevate their family, improve their living situation, etc., and it constantly pushes them to their next level. The only person who will ever be able to determine your motivation is YOURSELF. Deep post. Actionable and motivational. As I’m nearing that $100K mark, I’m preparing for the next level after that. Level after level. Baby step after baby step… until they become big man’s steps! Awesome!!! That’s the way to do it. FOMO is a serious problem for a lot of people, but I have had some success applying Derek Sivers’ “hell yeah” or “no” rule to my social life. I’ll still spend money on the things that I value but have no problem saying no to everything else. I’ve become very decisive and no longer feel guilty about the things that I choose to spend my money on. If you want to get to the next level, you need to figure out your priorities and say no to everything else. Great post! “One of the best ways to take calculated risks is to develop a set of principles to help you make decisions. Principles give you a framework for making decisions.” — Dalio’s book is on my 2018 reading list, looking forward to diving in soon. Looking forward to the next post Grant (and podcast w/ DD). Incredible advice. Too often people seek the steps that allow them to go on autopilot as soon as possible. If you want to keep reaching new heights you have to keep climbing and blowing through those plateaus. You have a limited amount of energy, its best to use it saying yes to the things that move you forward. Great article! I have no idea what my next level is, but I’m always looking for opportunities. I know some good things are happening soon – I intend to graduate with my master’s in computer science later this year, and my wife is pregnant and due in April (hello life inflation!) So we’ll see what happens. Exciting times, though. I like this. This is great advice. Sometimes "No" to myself too if I try to talk myself into spending mindlessly. As they say "Keep You Eyes On The Prize"!! In my opinion, you are missing a most important fact. Thats investing in yourself. If you start investing in your skills you can do whatever you want and can also create multiple passive income sources. I would argue your advice on retirement accounts. Why contribute a single dollar.more than my company is going to match if I want to retire early? I won’t have access to my funds, and very limited flexibility in how to invest them when they are trapped in the company 401k program. I’m a big believer in growing wealth outside of the “retirement system.” Am I wrong? I think it’s important to do both Shelley. You can always access the 401k funds through a Traditional IRA then a Roth IRA.